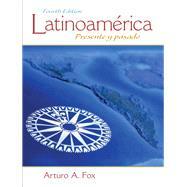 Latinoameacute;rica: presente y pasado, written by an expert in the field, introduces students to the cultures and history of Latin America from pre-Colombian times to the present. Written in an easy-flowing, narrative style, this new edition continues to offer an extensive yet tangible view of Latin American history. Furthermore,Latinoameacute;ricaexamines the Hispanic experience not only in Latin America, but also in the United States, a topic of increasing relevance and interest. Arturo Fox was born in Cuba in 1935. Moved to the U.S. in 1962. U.S. citizen. Degrees: Doctor of Laws, Univ. of Havana, 1960; Ph.D. in Spanish with supporting program in Latin American Studies, Univ. of Minnesota at Minneapolis, 1971. Academic positions: Instructor of Spanish, Luther College, Decorah, Iowa, 1963-66; Assistant Professor of Spanish, Dickinson College, Carlisle, PA,1966-72; Assoc. Prof, 1972-79; Prof., 1979-98. Chair, Dept. of Modern Languages, 1972-74; Chair, Dept. of Spanish and Italian, 1978-79; Chair, Dept. of Spanish, 1981-84, 1990-93; Coordinator, Latin American Studies Program, Central PA Consortium, 1968-77; Director, Colombia Semester Program, Central PA Consortium, 1977-78; Director, Dickinson in Málaga, Spain, , 1985-86, 1988-90, 1993-95. Recongnitions: recipient of the Lindback Foundation Distinguished Teaching Award, 1981; appointed William W. Edel Professor of Humanities ( honorary chair), 1992; biographical entry in Marquis “Who’s Who in America. Publications: Tree college textbooks: Otras gentes, otros modos, Holt, Rinehart & Winston, 1967; España: ida y vuelta, Harcourt, Brace, Jovanovich, 1981; Latinoamérica: presente y pasado, Prentice Hall, 1998; 2003; Anecdotario del comandante, a novel, Ediciones Universal, 1976; El Edipo en Unamuno y el espejo de Lacan (literary criticism), The Edwin Mellen Press, 2001. I have also published numerous articles on Spanish and Spanish American authors which have appeared in U.S. and Spanish literary journals. Travels: all countries of Western Europe, Hungary, Croatia, Servia-Montenegro, Bulgaria, Romania, the Czech Republic, Greece, Turkey, Egypt, Israel, Morocco, Thailand, Mexico, Colombia, Peru, Bolivia, Chile, Argentina, and five years of residence in Spain as director of Dickinson’s Malaga Program.